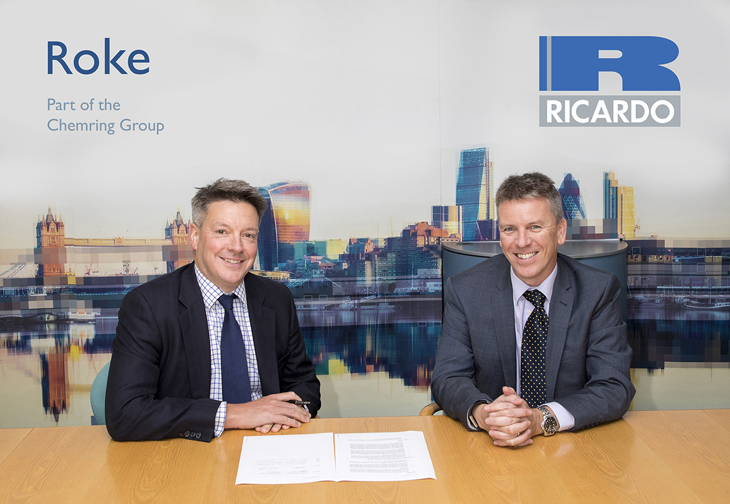 Ricardo plc and Roke Manor Research Ltd have signed a memorandum of understanding (MoU) to develop solutions that will make autonomous and connected transport robust against cyber attack. Providing and assuring cyber security is a fundamental requirement if the benefits of future connected and autonomous vehicles (CAVs) are to be fully realized. Many of today’s new vehicles are already connected over the air for telematics and maintenance, for safety systems such as eCall, by consumers using insurance-based monitoring technology, and by the many smartphone apps available to vehicle owners. With the increasing CAV content being included within new vehicles – including aspects of vehicle control through driver assistance systems, and ultimately, fully autonomous vehicle technologies – the potential vulnerabilities to cyber threats will increase significantly. Ricardo’s position as a global leader in technology and innovation within the mobility sectors, combined with Roke’s 60 plus years of experience cyber security for government and commercial clients, will combine to allow for a ‘one stop shop’ in designing cyber secure systems and infrastructure for the automotive sector. David Cole, Managing Director of Roke explains: “A new approach to CAV technology design and implementation is essential. From infotainment, maintenance and navigation, to vehicle to vehicle systems for fully autonomous driving – all provide a potential opportunity for malicious hacking attack. The two companies are already partners on the UK 5StarS project which aims to develop a 5-star type consumer rating framework for automotive cyber security, analogous to existing EuroNCAP type ratings for vehicle safety. Under the terms of the MoU announced today, Ricardo and Roke will contribute additional resources in parallel to their efforts under the 5StarS project, to develop joint product and service opportunities, building upon the synergies of their combined capabilities. “I am pleased that we have been able to conclude this MoU with Roke Manor Research,” added Ricardo CEO Dave Shemmans. “Through this partnership, our two companies are jointly demonstrating a commitment to delivering world-class solutions that leverage future technology and innovation while also ensuring the highest standards of safety and cyber security. This is a further demonstration of how Ricardo is willing and able to collaborate with leading specialists, to deliver synergies in terms of technology, products and services for the benefit of our respective customers.